How do I join a course on OpenLearning? So you've found a course that interests you but are wondering how to become a part of it? 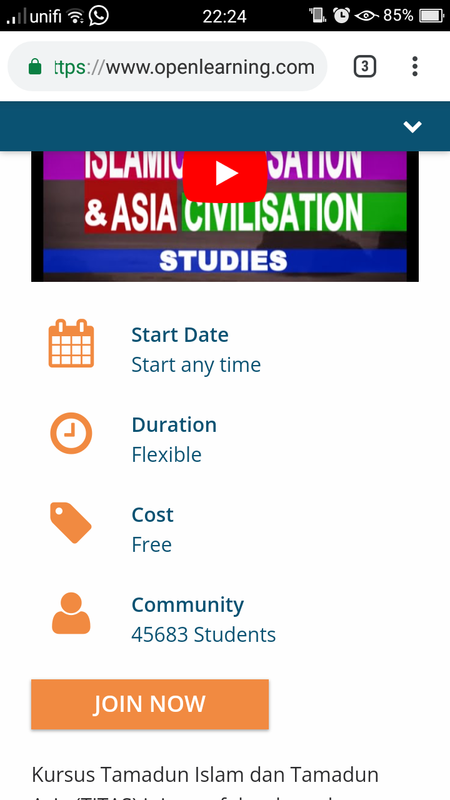 Click on the button and you can start learning and participating in the course! If you don't have an account yet, you will be prompted to create one. I have the following issue. I have linked my e-course on a website to join, but after pushing the button and creating the account, instead of getting straight in the course the main page of openlearning appears. Also the course is nowhere to be found either in the middle button up right of the page. Of course i checked that it is online. Is there a way to join straight in the course without getting in the main page? IASIS Hi, Can you please share us the URL to your course, please. We would like to see what's up. Thank you. I understand that first someone has to register and i completely agree with that, but i think it will be more convenient for users since they press the "join the course" button and the registration pops up for the first time then to be forward in the course automatically. I hope you understand what i am describing!!! If anything you need please ask. IASIS Hi, it seems there is a bug. We have informed our technical team to look into it. Thank you for escalating this issue to us. In the meantime, the temporary solution is for you to tell the students to click on 'Sign Up' instead of 'Join the course'. If they click on Sign Up instead, they will be redirected to your course without going to the main page. Then they can join the course as usual. Yes thank you. It does help as a temporary solution. If you have any news about the fix of this issue send me please and of course the whole community :) an update. Thank you again glad that i pointed out this bug, because you do a great job. IASIS Thank you. And to you too. Yes, will definitely let you know. please provide me the access code of the adobe photoshop course. how i join? You can get the activation code from the course staff. You can contact them by posting a comment or sending them a private message from their profile page. To reach that page, simply click on their name. Please note that some courses are private, and they may not be able to share the code with you. Hi i subscribed to the 3 month upsr package. However when i click "join now" i get the following error message "the email address youre using has not been invited to this course" The course im trying to access is FullAmark upsr package. How to know university id? NURIN AQILAH AMNI Hi Nurin, university ID is your student number. If you don't have one, type in n/a or zeros. I have an issue. I cannot join a course. When I click "Join the course button", it brings me back back to the original page. How I can solve his? I already deactivate my other account and this is a new one. But, the same problem happen. Megat Darwish Haiqal Hi there! Can you please link me to the course you're having trouble with? I'll do my best to help you out! This is the link. I hope you can sort this out for me. Thank you. Megat Darwish Haiqal bin Rozelan Thank you for the link! It seems to be working just fine. Did you check to make sure you are logged in before clicking the join now button? Megat Darwish Haiqal bin Rozelan Thank you for including a screenshot! I see that you're on mobile. Could you try joining the course on desktop? Perhaps it will work then. Omnaya Omar Nothing change...can you check what is the problem? Omnaya Omar sure. Thank you so much. Please let me know if that works! Omnaya Omar its working! Thank you so much Omnaya Omar . You and your team did a great job. Omnaya Omar Me too facing a problem joining TITAS putramoocs. Can anyone help me to sort out what is the problem? I cannot proceed to the TITAS main page. It keeps staying on the openlearning page. hello there it seems like im having a trouble to join the TITAS group as I have the following issue. I have linked the TITAS group on a website to join, but after pushing the button and creating the account, instead of getting straight in the course the main page of openlearning appears.can anyone help me? Hi NURFARAHIN , can you share with us the Url Link to go that course that you have mentioned? Amirah Aishah Bt Markom Hi there! I have manually enrolled you in the course. You should be able to access it now. Omnaya Omar thank you ! by the way, may i know how to enroll into this course because all my other friends have the same issue as me. Omnaya Omar ahh i see! Alright ! Thankyou so much for helping us ! Waiting for the update from you guys. Amirah Aishah Bt Markom Hi again! The enrolment issue should be solved and all users should be able to join by clicking the "join now" button. Omnaya Omar alright thankyou ! Hi... I love this concept! 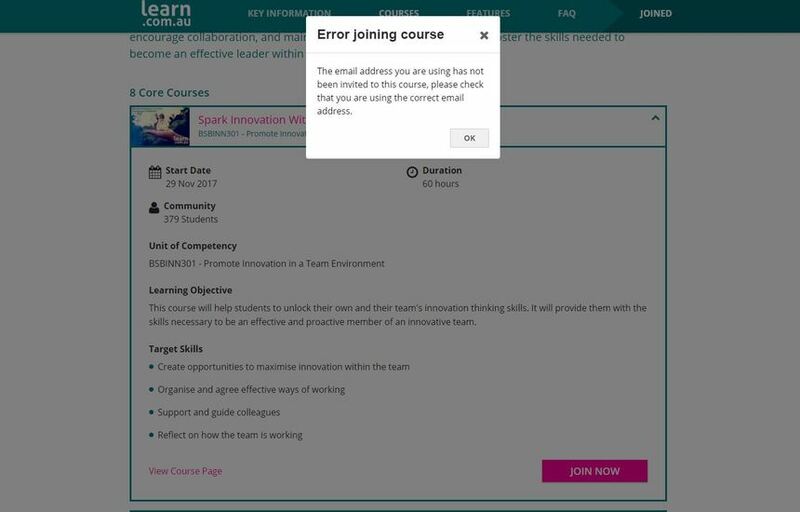 I would like to start BSB42015,when i hit the join now button course i get this message "The email address you are using has not been invited to this course, please check that you are using the correct email address". What am i doing wrong? Omnaya Omar Thank you for the reply. Unfortunately, I am not seeing the "who is supporting you" button or an area to place a code into. Attached is what I am seeing. Your help would be very much appreciated. John Brady Thank you for the screenshot it's very helpful. I see now that you're on Learn which is a bit different from standard OpenLearning. Could you please link me to the course you're trying to join so I can have a look? John Brady Hi John! Unfortunately, Learn.com.au courses have been turned offline by the course creators! We hope you can find something else! Perhaps browse through here?